Do you enjoy singing ? We would welcome you to audition with us! We recruit the most beautiful voices in all ranges. 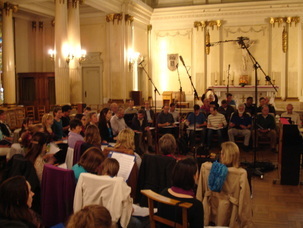 As a mixed choir of eight sections (more than 80 choristers), the European Union Choir has aimed since its creation in 1958, to perform the sacred and secular works of European composers from across the different classical music periods (baroque, classical, romantic et contemporary works). As a chorister in the EU Choir you will gain a unique experience of a wide range of music as well as cultures since the members come from diverse countries and regions. A choir member of the EU Choir is also fortunate to rehearse in the wonderful space of the Royal Military School chapel and to sing in some of the most renowned concert halls in Europe. * Working in the European institutions or being a citizen of one of the Member States of the EU are not a prerequisites for joining the EU Choir. If you are tempted by this great experience, contact us to take part in one of our rehearsals. We would be delighted to welcome you. At the end of this rehearsal you can subscribe for an audition which is obligatory in order to become a member of the EU Choir. You will be given a piece of music to prepare in advance of the audition. The candidate is accompanied on the piano. The outcome of the audition will be decided on the same evening after a short deliberation. The jury includes Dirk De Moor (the conductor of the Choir) and three other members. The rehearsals take place in Brussels, in a chapel of the Royal Military School, rue Hobbema 8 (near the Cinquantenaire Park), every Thursday from 20h00 to 22h00 as well as on one Monday each month (separate sectional rehearsals – at the same times).